San Francisco, CA, January 24, 2019 – Biocare Medical, LLC, a leading provider of innovative, automated immunohistochemistry (IHC) instrumentation and reagents, announces the release of the VALENT IVD (in vitro diagnostic) automated staining platform. 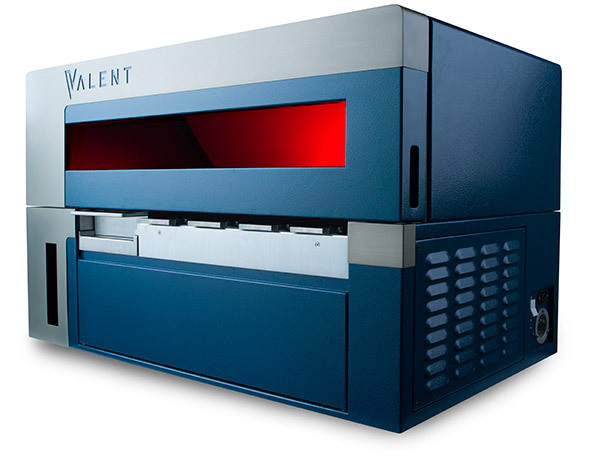 VALENT is the industry’s first fully automated, open platform, merging high-throughput and quality staining with a powerful and intuitive user interface. VALENT overcomes the limitations of closed systems with its unique open platform, allowing reagents from multiple sources and providing top-tier IHC results. VALENT transforms clinical, pharmaceutical and research laboratories by providing an easy-to-use fully automated platform, 48-slide capacity, multiplex IHC capability, and high-quality staining. “The on-line HIER feature of Biocare’s VALENT enables walkaway freedom for the histotech,” said Cheryl Bodden, Histology Laboratory Manager at USF Health Labs. With VALENT, the IHC protocol is completely automated; performing fast, non-toxic online deparaffinization and utilizing a novel, patent-pending, continuous antigen retrieval dispense technology. With VALENT, Biocare offers a full line of high quality, ready-to-use reagents that have been optimized for maximum performance supporting convenient load-and-go capability, and ultimately enhancing laboratory workflow. The open platform of VALENT enables users to apply enzyme pre-treatments, antibodies, detections, or chromogens from any source. These combined capabilities significantly increase laboratory efficiency, flexibility and turn-around time; freeing up valuable time and resources. VALENT breaks the 30-slide barrier, processing 48 slides simultaneously and supporting unparalleled throughput with minimal hands-on time. VALENT employs a high capacity lithium battery to boost the antigen retrieval process and safeguard staining runs in the event of power loss. By enabling users to process more slides per run, safeguard against power fluctuations and provide onboard backup power, VALENT technicians enjoy peace of mind knowing their runs will be completed on time, every time. VALENT is equipped with an array of automatic sensors, minimizing errors before and during runs. The software has an intuitive user interface, placing frequently used functions in a color-coded block on the main screen. The onboard mixing capability of VALENT allows for a walkaway operation and with a 50µL reagent vial dead volume, it also minimizes precious reagent loss, saving money. The convenience of separating hazardous from non-hazardous waste also reduces disposal costs. A level slide and instrument are critical for reagents to be evenly dispensed, ensuring consistently stained, high-quality IHC results. VALENT utilizes a dual-axis inclinometer which, when combined with motorized legs, allows it to self-level. The electronic inclinometer eliminates the reliance upon traditional, subjective levels while offering traceability for end-user record-keeping and regulatory compliance. With motorized legs that can be height adjusted, VALENT also provides optimal user ergonomics. VALENT performs several self-cleaning techniques to improve stain quality and reduce valuable time that technicians would otherwise spend cleaning. Automated cleaning processes ensure optimal performance and reduce variability. Automated probe and wash station cleaning, as well as weekly automated cleaning routines, maximize staining results and efficiency. Biocare Medical is the proven leader in simultaneous Multiplex IHC, allowing for visualization of multiple antigens on a single slide. VALENT is designed with simultaneous Multiplex IHC capability, enabling laboratories to save time, money, and precious patient tissue samples. Biocare Medical is a global leader in solutions for cancer research and diagnostics, providing: world-class reagents, including tissue-conserving simultaneous Multiplex antibody cocktails and detections; renowned Customer Care; and a comprehensive suite of advanced instrumentation for IHC, molecular, and histology testing. Customers include clinical anatomic pathology laboratories, pharmaceutical companies, CROs, and biotechnology companies as well as academic, government, military, and other non-profit laboratories. Biocare’s reagent portfolio includes primary antibodies, Multiplex IHC, and FISH probes for target indications. Biocare also offers a unique line of polymer detections for clinical, human, and animal research that deliver high sensitivity and exceptionally low background. The Company’s advanced platforms of semi and fully-automated instrumentation have been designed to meet every need from high throughput clinical diagnostics to flexible research requirements. Biocare Medical’s corporate headquarters and operations are based in the San Francisco Bay Area with a global distribution network. This entry was posted in Blog, News & Press. Bookmark the permalink.